Cybozu Vietnam is a development branch of Cybozu, No.1 Groupware Maker in Japan. Our business philosophy is to devote for teamwork all over the world. From No.1 position in Japan, we have been making an effort to conquer the No.1 level in the world. Let's join Cybozu to execute this mission. We always take employee's development into account and try our best to facilitate employees to work and stick to our company in long term. We have been developing Garoon, a major software of Cybozu for enterprises, with capable of responding to demand of large-scaled company with 10,000 users. We also have a chance to develop SP Apps, an add-on tool built on Sharepoint to enhance Team Project productivity. In this project, just the requirements are done in Tokyo. We are in charge of all the development process here in Cybozu Vietnam. What’s the #1 reason you chose Cybozu Vietnam? Using something made by yourself in the daily works is so proud and wonderful. In Cybozu, we can save a considerable expense by using our products in work for fully reporting, discussing, and sharing information, instead of buying outside products. I think Cybozu is a great place to pursue the development of software products and enhance teamwork. Working directly with engineers from other branches such as Tokyo, Shanghai in the same product helps me improve skills day by day. I’m an Engineer in Test Engineer Team. My job is to research new technologies, build up support tools for Manual QA team, create and implement Automation frame work and involve to improve Quality Assurance process directly. I love working at Cybozu! The reason is not only the working environment, good equipment but also the strategy to build up individual career path for each member here. At the Cybozu I found where 3 important factors matched perfectly: My qualifications, my expectations and my duties. Right after my university graduation, Cybozu has become my very first long-term working company, that is where I chose to build up my career as a web application developer. From the very first moment I worked here, I felt that Cybozu is the exactly right place which I used to imagine and wish to have a chance to work there: amazing working environment with talented people, world-class IT products, joining to up-to-date and dynamic technologies and many many things further. Chế độ tốt. 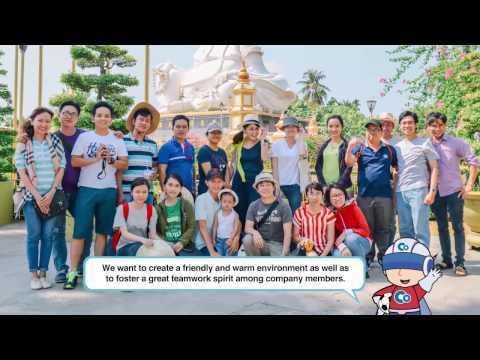 Có chế độ team building công ty chịu 50% chi phí. Làm theo Scrum nên không OT.. Follow Cybozu Vietnam to get updates about new jobs.